20-25 minutes until the potatoes are tender and the chicken is cooked through with no pink meat remaining. 2. Meanwhile, toast the cashew nuts or peanuts in a small non-stick frying pan for 3-4 minutes until golden brown. Deseed the chilli and slice it into long shreds. Set aside. 3. 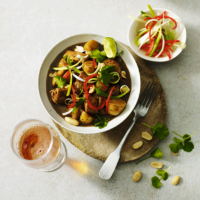 Divide the curry among 4 bowls and scatter with the toasted nuts, coriander leaves, chilli and salad onions. Serve with rice and lime wedges for squeezing over. Boost the vegetable count in this curry by stirring in some baby leaf spinach just before serving.